Here’s a full recap from the 5th annual Corinth Canal SUP Crossing, the final stop of this year’s Hellenic SUP Cup series in Greece. This annual event is one of the most incredible-looking SUP races on the planet. 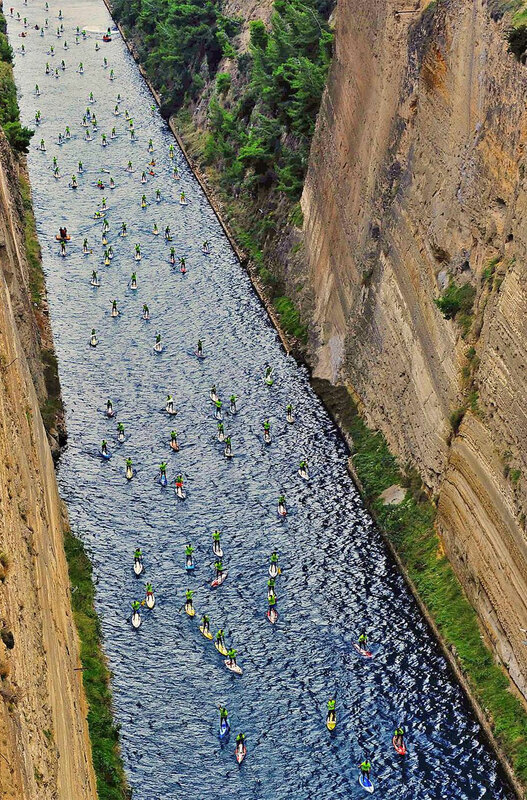 A couple of years ago we nicknamed it the “World’s Straightest SUP Race” because the course is basically a 6km drag race from one end of the Corinth Canal to the other. Just take a look at these photos… Definitely one to add to your bucket list. More great photos over on the sups.gr Facebook page. “It has been since 2009 when we first saw SUP races in other Europe countries, and dreamed to organize such race in Hellas (Greece), as the Hellenic SUP community was just at its birth. Many ideas for the place were thrown on the table, but only one was standing out. And that was Isthmus. The famous historic Canal of Corinth. The canal was built in 1881 but was envisaged by the tyrant Periandros way back in 7th century BC to help the naval traffic. Today 5 years after the first crossing by 24 paddlers in 2011, the second by 65 in 2012, the third by 129 in 2013, the fourth by 147 in 2014, we stood ready for this unique crossing on November 1st 2015. With the weather being cloudy, the wind strong at 25-30 Knots and the temperature really low, organizers were facing the worst case scenario: Just one day before the race there was a real possibility they would have to postpone or cancel the event. But such a thing was not an option for them as more than 160 participants had signed up for the race, not only from all over Greece but also from other European countries. The final approval on Sunday had to be given from the Coast Guard. Hesitating at first for the wind, they were very cautious, caring about paddler’s safety. After inspecting every detail of the race plan, they gave their permission. The race is ON! Then the only problem that had to be solved was the canal’s current. During the previous week the current was changing direction every 6 hours as usual. But this had changed, due to the strong N-NE winds blowing at Corinth two days before the race. With the help of the Canal’s personnel and their experience, organizers managed to postpone the start of the race by 2 hours. Just enough time for the current to change and do everything as planned. At 12:30 p.m. all paddlers lined up, just before the Isthmia Bridge, struggling to keep their position as the wind and the current were giving them, hard times. Finally everything is ready for the grand finale of the 5th Hellenic SUP Cup 2015. World’s “straightest” race of 6.345 meters has just begun. The sound of paddles hitting the water was covering the cheers from the crowd watching the race from the shore across the canal. The wind was still strong above the canal, making turbulence inside. Blowing sometimes in favor, other against and other on the side, paddlers had to adjust their technique and strategy to overcome these every-minute changes. After the first 500 meters where the distances were made and everything became more clear… SILENCE. The incredible silence that rules inside the canal with these massive (80m high) vertical walls. Only heavy breathing from paddlers, trying to find their pace. Great battles were given and many lead changes occurred throughout the whole length of the canal. 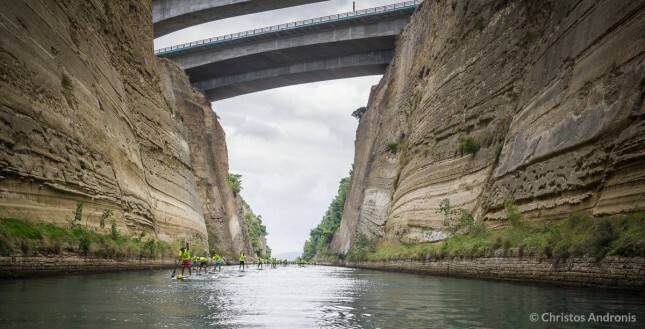 It was challenging, with paddlers facing the strong gusts of headwind, which made them literally stop at times, or wind from the side that pushed them off their straight line. As usual, George Fragos (Naish), George Konstantis (Naish/Fanatic), Alexandros Prapas (Rogue) and 15 year old Nikos Sirigos (Naish) made the leading pact with 14 footers and gained some distance from the rest, keeping the same order until the finish line for Men 14’0”. Big surprise was also another two 15 y.o. 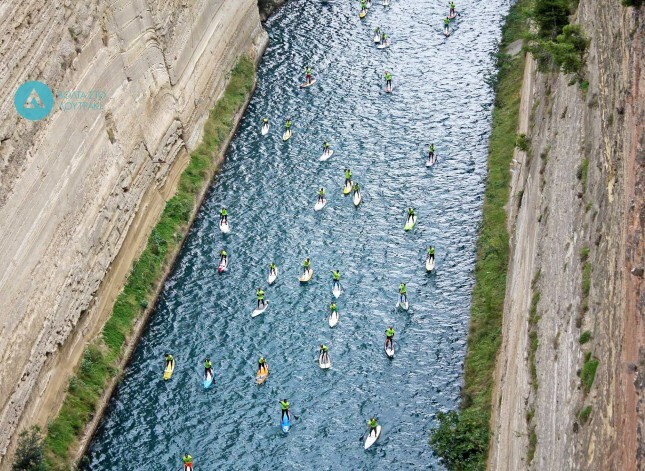 paddlers. Zahos Koumoudiou (Naish) from Cyprus, who managed to pass one by one every paddler he had in front of him and finish in 5th place Overall and first in his category (Boys 14’0”), followed by Phedon Doukas (Naish) completing the first six athletes in 14 footer. First in Men 12’6’’ crossing the finish line was Dimitris Apalagakis (JP), with John Tountas (Naish) in second place and Mario Kriti (Naish) in third. 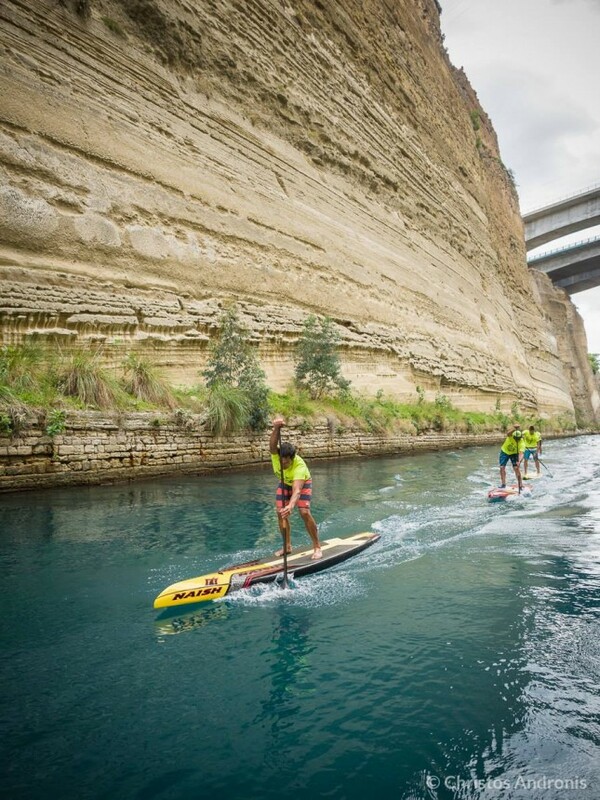 First woman finished was Mikaella Giasoumi (Bic Sup) with her 12’6”footer. Despite all challenges that had to be faced, everyone kept going and gave their own little battle until the finish line. The last part of the race was the most difficult, as the wind was blowing furiously (25-30 knots) at the exit from the canal and just a couple hundred meters from the finishing line. The best scene of the race was the two last kids (8y.o. and 10y.o.) finishing the race amid cheers from the crowd watching but also from all other competitors as well. After the race the athletes were transferred back to the start with busses, where they had lunch inside the beautiful garden of Canal’s management building (Α.Ε.Δ.Ι.Κ). The time for the award ceremony of the 5th Hellenic SUP Cup 2015 and Corinth Canal SUP Crossing had finally come. Winners from all categories were awarded. Among them also the oldest (Master) and the youngest (young gun) paddler. Organizers had planned also 4 big prizes for the winners of Men and Women in 14’0” and 12’6” categories. Each of them won a ticket to Paris plus participation to Nautic Sup Paris Crossing on December 6th. This difficult, from many angles, race was the final race of 2015 Hellenic SUP Cup, which started on May 1st at Andros island and ended on November 1st at Corinth Canal. It was the fifth consecutive year of this SUP race. 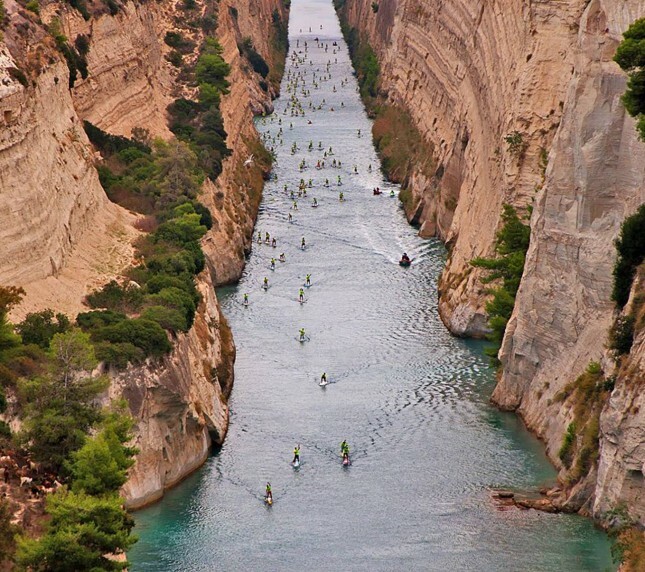 A race, which sent the right message and managed to establish its existence in Greek watersport culture, with the Greek SUP community growing year by year. Organizers will also want to thank every paddler who traveled across every corner of Greece (Parga, Larisa Mykono, Kriti, Keflonia, …) and those from Cyprus, France, U.K., Spain participate in these races and helped to raise the level of Greek SUP scene.